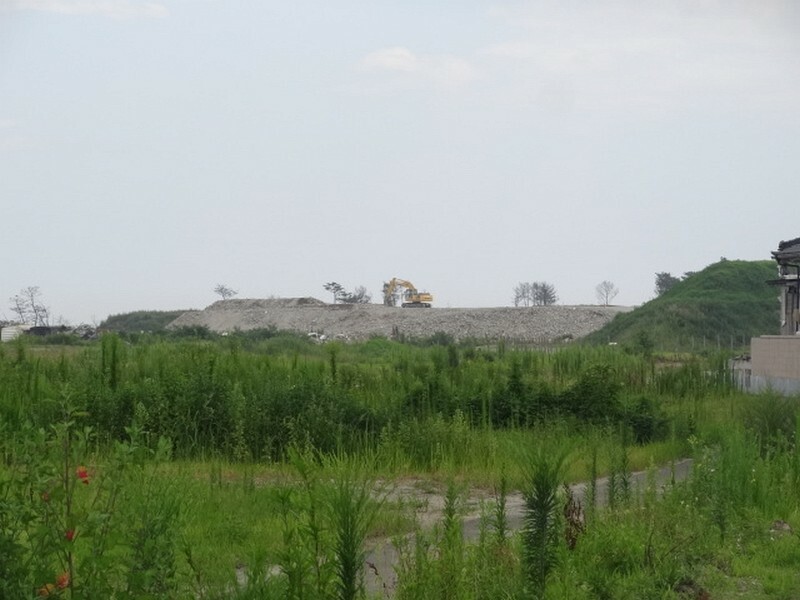 Okada being on the Sendai Plains was not affected as badly as some areas such as to the north (ie: Minami Sanriku) and to the south (Fukushima Daiichi Nuclear Power Plant). The broad wide open plains allowed the sea to spread wider instead of being channelled into the narrow valleys of hilly areas. 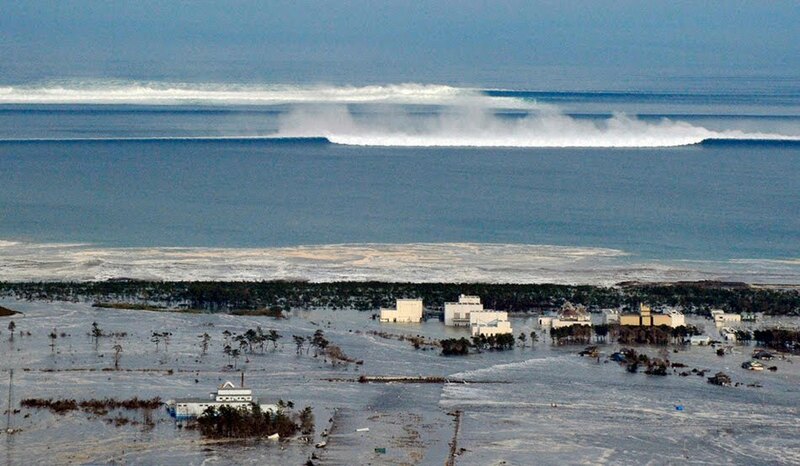 Dramatic scene of more waves about to arrive on the Sendai Plains. As a result the highest waves reached 2 meters at Gamou as opposed to 20 meters further north. Even so, many buildings were destroyed and swept away, but perhaps as many as 50% survived, sustaining damage on the two lower floors. 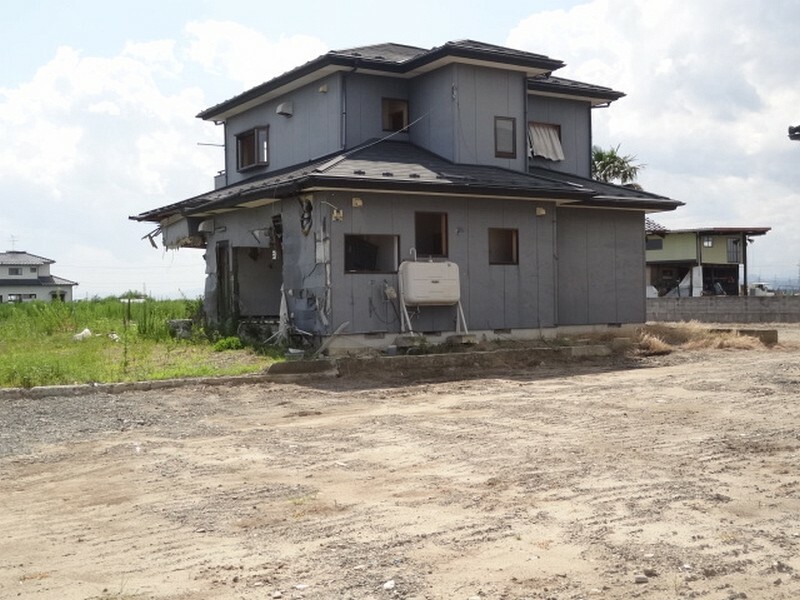 These buildings have been gradually cleared of the silt and other debris and restored to a livable condition. Yet another debris mountain in the distance. Damaged house remains untouched 2012. Earthquake insurance is expensive in Japan so most people self insure. When disaster strikes then the family needs sufficient reserves to rebuild. One advantage is there is no fighting with insurance companies reluctant to pay their clients as we have in Christchurch. 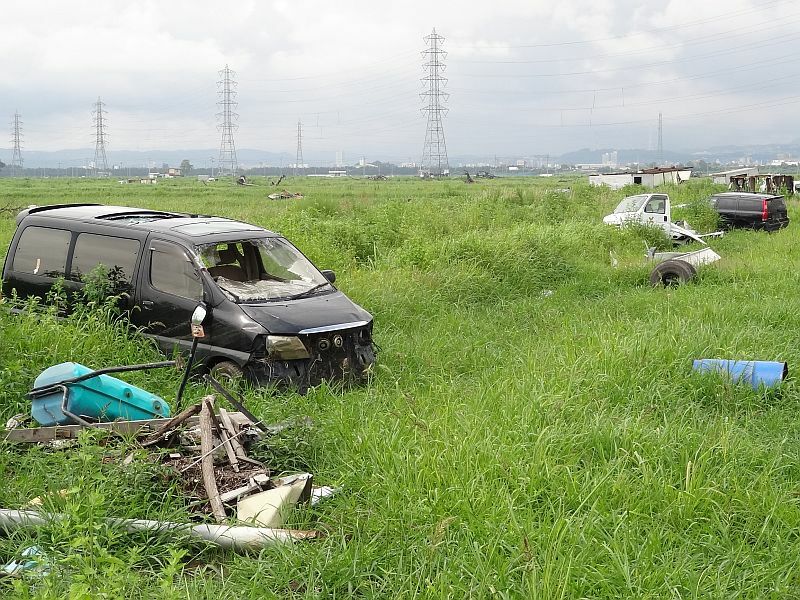 The debris lying in the fields in 2011 has been cleared now. 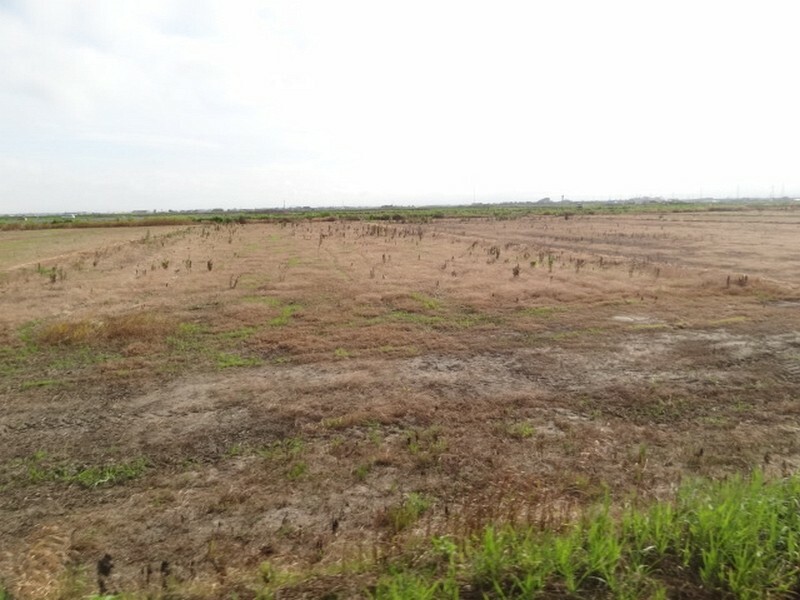 But the soil remains uncultivated and contaminated by silt and salt. 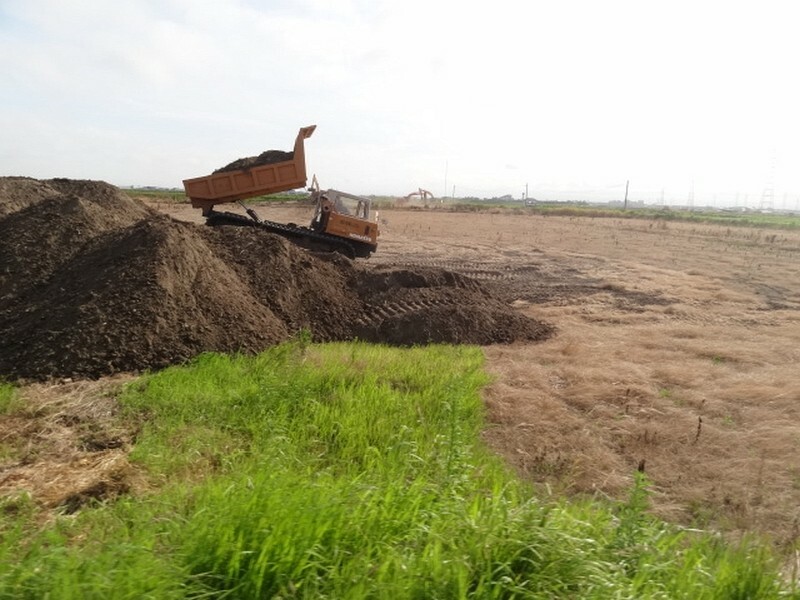 There are excavators in the fields laying topsoil. Seems like they will soon be planting crops perhaps for a 2013 harvest. New top soil being laid in preparation to resume planting. The same view (above) has one year later been transformed into this. 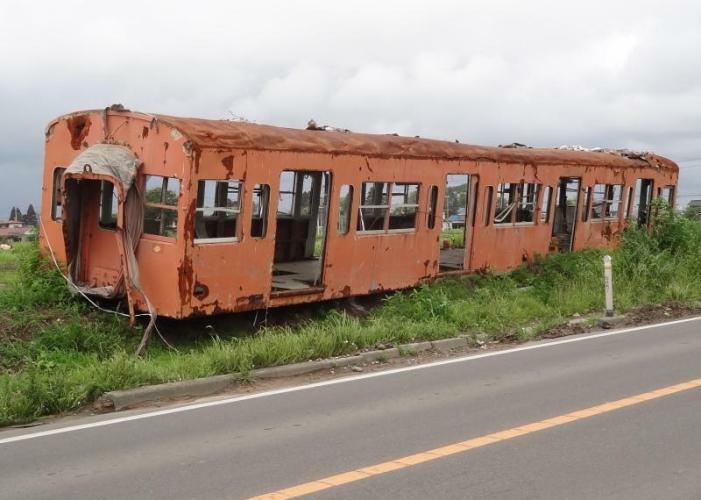 The railway carriage and the temporary 7/11 convenience store have gone. 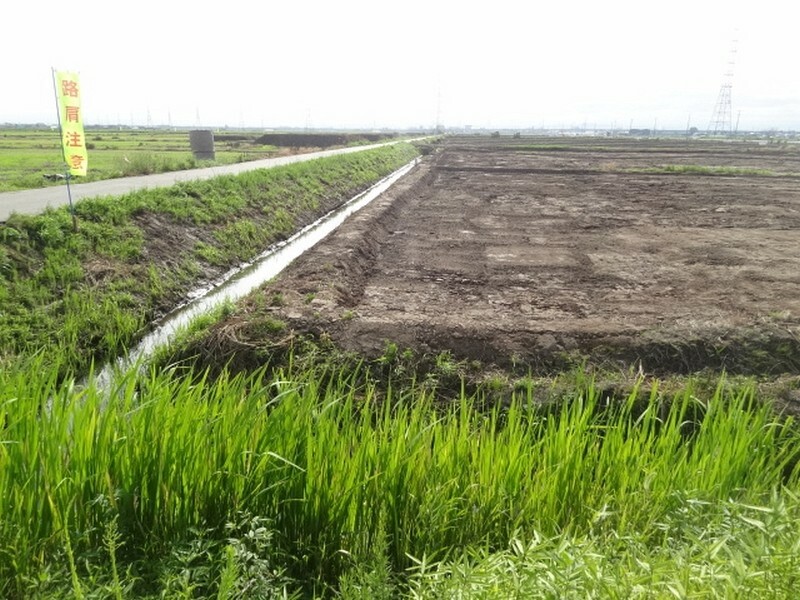 Okada escaped mostly OK, Gamou suffered extensive damage, and the government has decided to build a 7 meter seawall to better protect them. The village of Arahama further south is not so fortunate. 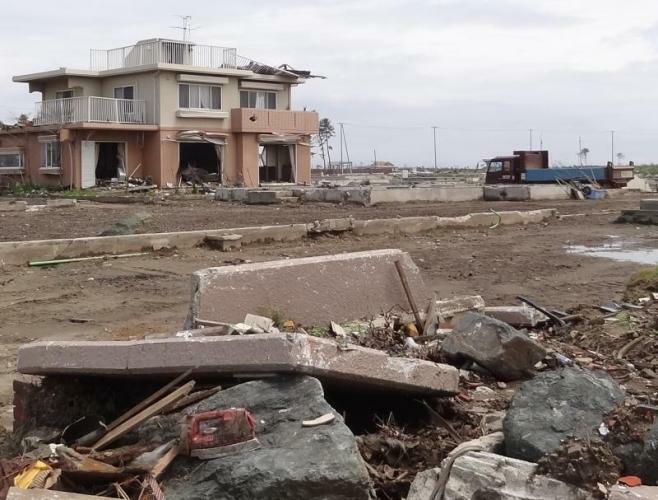 The tsunami reached 10m and the remains of most of the buildings ended up in the adjacent fields and so defending the village from similar events is considered beyond what is acceptable. 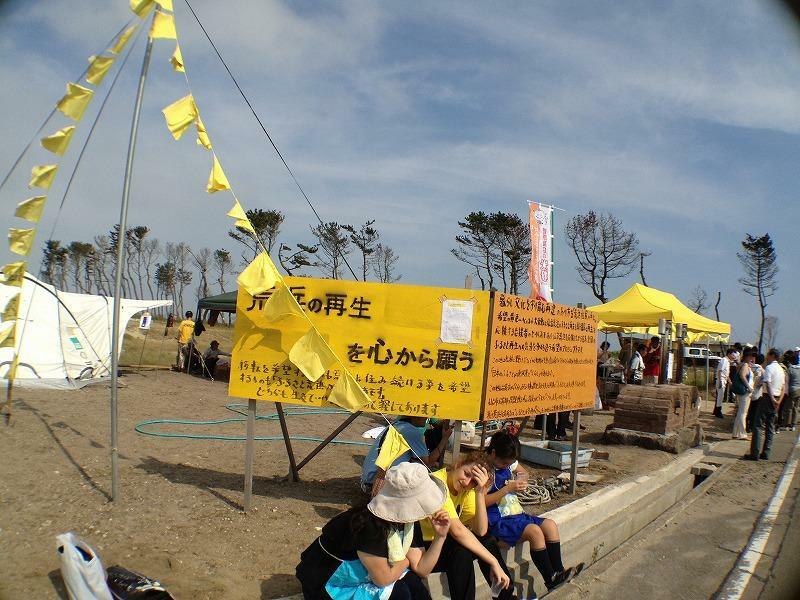 Yellow handkerchiefs, Arahama residents want their village rebuilt. The film is a about of hope and friendship and based on the Tie a Yellow Ribbon song. In the film handkerchiefs have replaced ribbons and an old oak tree replaced by a post. 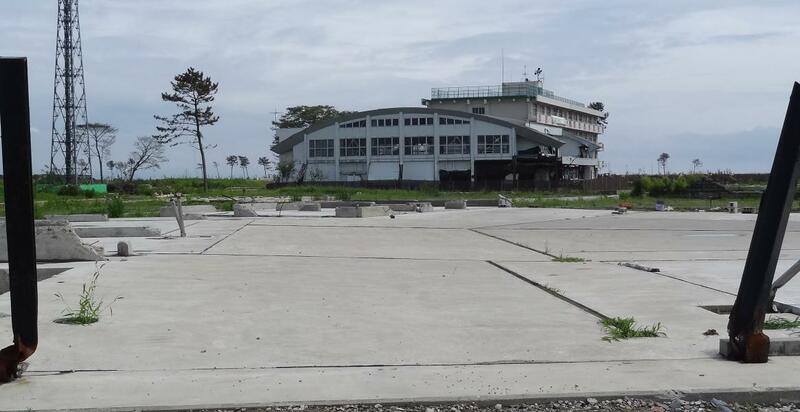 Arahama’s petrol station remains untouched. 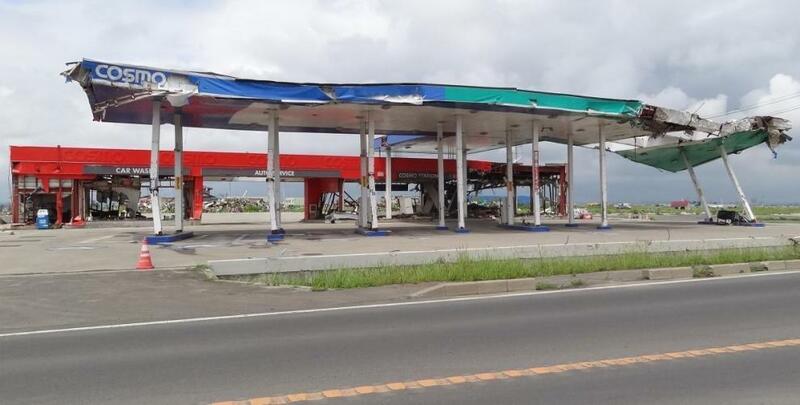 The petrol station was located more than a kilometer from the ocean but was still overtopped by the wave. Google maps now show it has been demolished (March 2013). 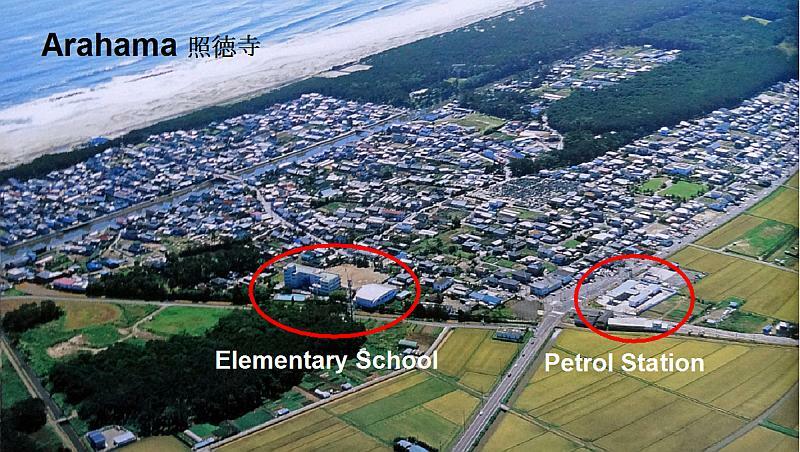 Arahama Elementary School is still there. 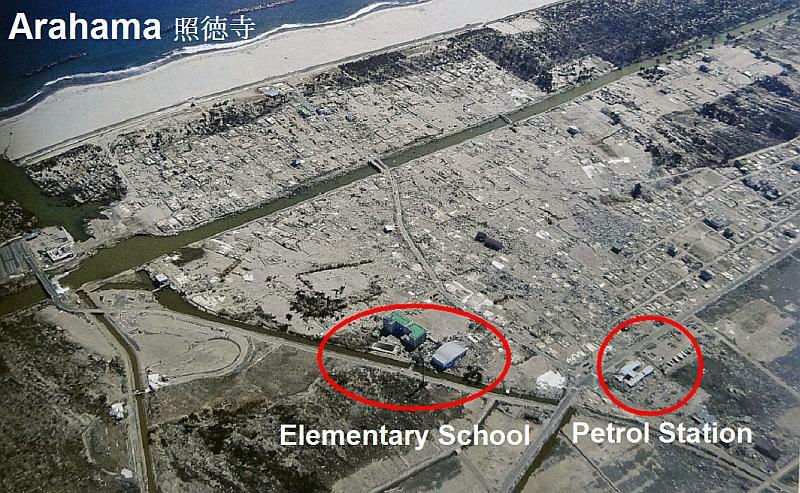 Arahama Elementary School was the only building higher than the tsunami in Arahama. Aerial view of Arahama before. Aerial view of Arahama after.